Having just returned from Mayo where I could freely drink from the Social Media waters, it seems a letdown to return to my hospital where access to Facebook, Twitter, Pinterest, Slideshare etc is blocked. Even email updates about our internal private Yammer network are filtered out by their spam filter. At the recent Mayo Social Media Residency I shared my views with representatives from Lehigh Valley, City of Hope, American Acedemy of Orthopedic Surgeons, Baylor University, The Doctors Company, Sutter Health, the list goes on and on. They were amused about my system’s inability to embrace Social Media. While the meeting was underway, we were broadcasting live Tweets, Blogs, and posting videos to social media sites. That is not possible where I work. This is not likely to change soon. At the Residency we were shown a video of a speech by Mayo’s CEO Dr. John Noseworthy who in 2009 exhorted the clinic to accelerate effective application of social media throughout Mayo Clinic. 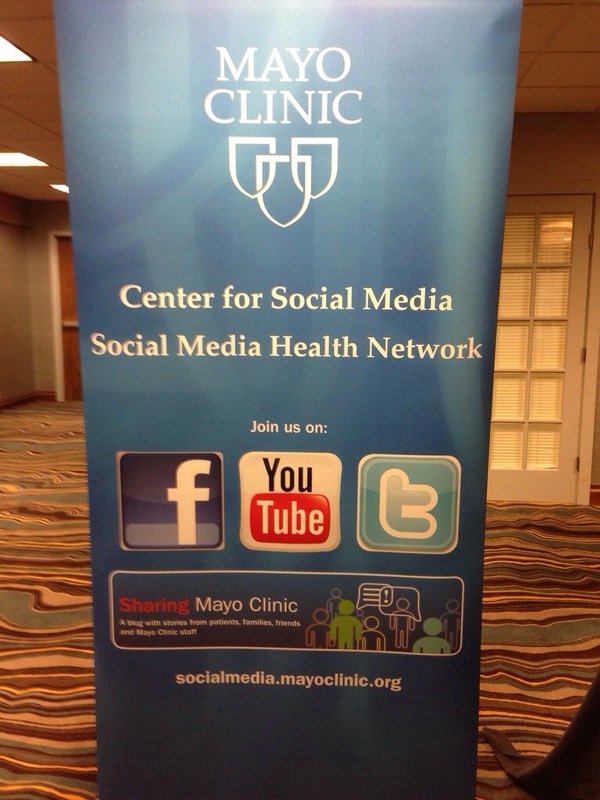 A year later the Mayo Clinic Center for Social Media was launched. The rest is history for all to see on the Internet, unless you are at my hospital (I attempted to look at the Slideshare Mayo Social Media history but my access was blocked). My health system can and should do this. The change will have to bubble up from us minions at the bottom driven by progressive loss of our digital footprint to other more progressive health centers. If we wait for the change to come from above, I fear I will then be closer to reaching Medicare eligibility. One day I left my village and travelled to the city. I read many wonderful books and I came back to my village and told the villagers about these books. However they could not see what I learned nor could I show them because books are banned in my village. I felt like a delegate from North Korea who came to the Mayo Clinic to learn about Social Media. Upon my return home, I was not able to show my country folk the value of Facebook, Twitter, Pinterest since my country does not allow access to these sites. This is the problem I face at my hospital. I want to demonstrate to my colleagues the wonderful things that social media can do for their practice and for medicine and for their patients. The problem is the access to all social media on the Internet at my hospital is blocked. The only way to show them the benefits of social media is by taking them off campus. Even more laughable is that all emails from my friends at the Mayo Clinic Center for Social Media are filtered out by my hospital system spam filters. So much for a two way conversation. My Health System Among the Most Wired? In July 2013 I saw the headline: My system was named among the national Most Wired providers. Really? What I really like is irony and I can’t keep quiet about something this ironic. When you turn on your wireless device at my Medical Center you will see an invitation to “like” it on Facebook. Click on it and you find access is blocked. Try going to your Facebook page, you can’t. Try to Tweet about this Most Wired facility, you can’t. I have asked why. Answers range from security to patient privacy. Leadership told me that Most Wired refers internal processes, their medical record and communications. So semantics aside, internally we are well connected. But greater acclaim will come if this medical system starts to connect externally to the rest of the digital world. Internally, communication amongst ourselves is impeded. I joined Yammer which is a private social network. Only employees of my hospital can see its private Yammer network. In this ‘Most Wired’ hospital all emails from my colleagues about Yammer are filtered out by its spam blocker. The reasons given resolve around security. At Mayo access to all these Social Media venues are not blocked. Is the largest integrated health system in the world less concerned about security than my system. The reality is that my system shows its weakness in this matter. Am I trying to stir the pot? You bet I am. I want to engage my own system, in a discussion about the importance of Social Media and Health Care. I am tired of hearing No. Let’s talk instead or as they say in Social Media, let’s engage. It isn’t just Social Media, it is Social Engagement or Exchange. My hospital needs to be ‘wired’ to the digital community to truly deserve the Most Wired award. Mayo Clinic Social Media Residency in session. I’ve talked to many of the attendees who not surprisingly have heard about Geisinger health system. They have heard of Obama’s pronouncement that it is one of the model health systems in United States. They have seen the June 2012 TIME Magazine cover which features our health system prominently. Yet Geisinger has a tiny digital footprint with a negligible social media presence. Ironically if a similar social media residency were held on our Geisinger campus, real-time blogs and tweets would be blocked on its wireless system. Nothing stops me from blogging or tweeting about this wonderful event. I will continue to do so until the barriers to social media are taken down on the Geisinger facilities. 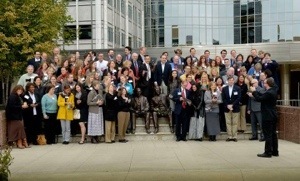 Here is the group enjoying learning about social media, despite the bitter cold. In early October 2013 the Geisinger Health system held a special one-day conference on social media. I was unable to attend since I was at the annual American College of Surgeons meeting in Washington DC. I would hope that from such a meeting Geisinger would come out of the dark ages and start to allow its employees and others to access social media while they are on their facilities. Since the meeting nothing has changed. Though wireless access now no longer requires a password when you get a message to ‘like’ Geisinger on Facebook while on it’s wireless system you find yourself instantly blocked. Similarly, access to Twitter, Pinterest or any of the other important social media sites continue to be blocked. Any inquiry about the reasons are met with the answer that Geisinger is very concerned about patient privacy. Why can large systems like the Mayo Clinic successfully engage with social media? Is Mayo any less concerned about patient privacy than Geisinger, I doubt this is true. Meanwhile patients and their family, doctors, nurses, other healthcare providers are walking around Geisinger most of whom are carrying a mobile computer in the form of a smart phone or tablet. These folks have the ability to photograph or film anything going on in the hospital so if Geisinger is so concerned about privacy why doesn’t it confiscate these devices at the door? Instead of metal detectors, Geisinger could install detectors for smart devices. I am being facetious. My hope is that with time and I hope this time is soon, that the Geisinger system will allow access to Social Media. It is only through such access that the system can improve its engagement with patients and their families. The benefits are immeasurable.